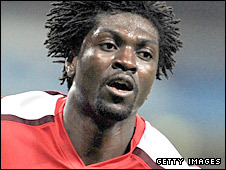 Striker Emmanuel Adebayor says he will not leave Arsenal until he has helped fill the club's trophy cabinet. Arsenal have won no silverware since Adebayor's arrival in 2006 and missed out on the Champions League final after losing to Manchester United on Tuesday. But Adebayor, linked with a move to AC Milan last year, said: "Next season, 100%, I am an Arsenal footballer. Meanwhile, midfielder Cesc Fabregas has said a fourth-place Premier League finish is not good enough for Arsenal. The Spain international was outplayed in midfield as Arsenal were overwhelmed 3-1 by Manchester United in the second leg of the Champions League semi-final at the Emirates on Tuesday, going out 4-1 on aggregate. But while the Gunners are currently unbeaten in 21 Premier League matches, Fabregas said another season without trophies is not acceptable. "When you play in these sort of competitions you have to be at your best and we have not been at our best," said the Spain international. "Fourth spot for Arsenal, I do not think is good enough. "We have not been at the level that everyone expected for Arsenal Football Club, that is for sure. "We have to try to finish the season as well as we can and be ready for next summer because as we have seen this year the start of the season is really important." Team-mate Adebayor, who signed a new contract at the end of last season, said he would only consider leaving Arsenal after they have broken their four-year run without a trophy. "Arsenal put me where I am today - they made me one of the biggest strikers in the world," said the 25-year-old. "I have to pay them back. "How am I going to pay them back? Make them win trophies. That is what I am here for and I have to fight for that. "I do not have any reason for leaving until I get the trophies that I came here for." Arsenal are secure in fourth place in the Premier League but trail third-placed Chelsea by six points, a deficit they can cut to three when the two teams meet on Sunday. Fourth place would give see the Gunners enter the final qualifying round for the Champions League proper next season, while third place guarantees Champions League qualification for the 2009-10 campaign. And Adebayor, who has scored 16 goals from 36 appearances this season, believes Arsenal can still overhaul their London rivals. "We just have to play for our dignity, show character and hopefully come back," he said.